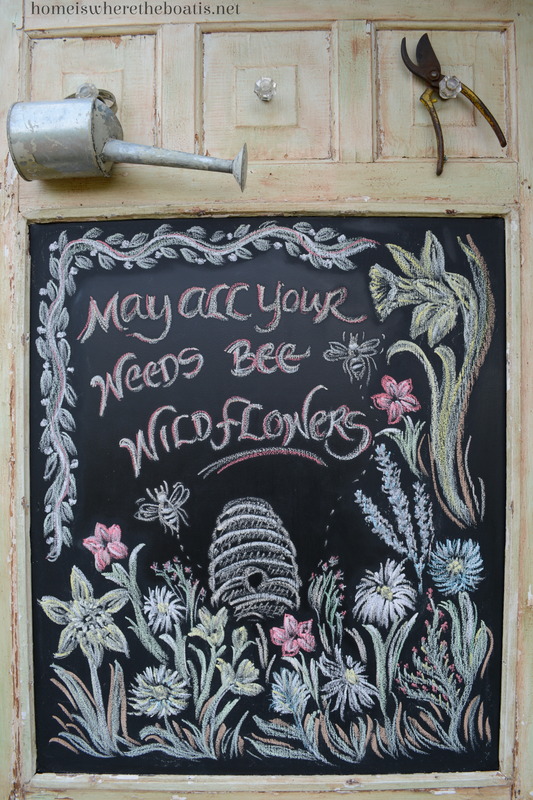 May All Your Weeds *Bee* Wildflowers and Giveaway! with a wee summertime giveaway! I was buzzing around T. J. Maxx when I spied Quattro Stagioni Canning Jars a year ago, and again more recently a couple of weeks ago. just-picked bouquet from the garden! at each place setting. . .
in my field of dreams. . .
areas because of its ability to spread so rapidly. Passion Flower or vine, invasive and growing with abandon in the field next to my Potting Shed, is pushing its way up through the cracks in the porch. In celebration of Bee Season, Garden Bouquets and Summertime Sipping, I’m giving away 2 sets of 4 Quattro Stagioni Canning Jars! how you would use them. . . The winners will be chosen August 8th! 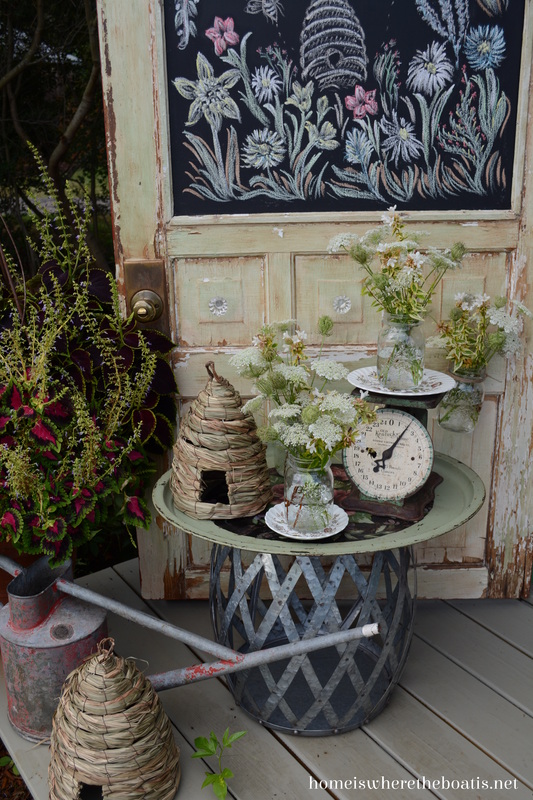 Love this whole vignette … I would use them for a garden cocktail party. I would use them for making and storing preserved lemons. Also, I just saw a recipe for a currant liqueur made by soaking currants in vodka for a couple months. The resulting elixir turns out a gorgeous pink/burgundy color. Would be lovely in these jars both during the soaking and after straining. Gifts!! I would cut my garden bouquets and be-gift my friends with pretty flowers in a fun jar that they can refill. And a special one would go to my sister-in-law who is a Beekeeper and has taught me much about our bees! Saw these last year on your site and could never find them. Love them!!! Love your art blackboard–wish I was that artistic. 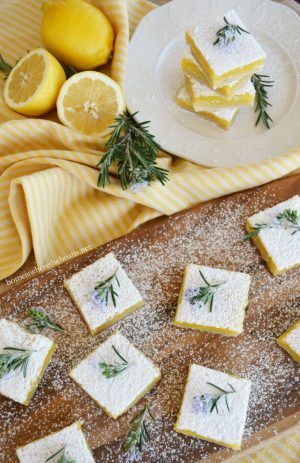 I would use the Quattro Stagioni canning jars for a double serving of mock lemon bars–bake the lemon bar shortbread base and break into pieces and layer with lemon curd. Yum! I am a faithful follower of your blog! How adorable! I’ll use the jars to serve desserts outdoors! Mary, your pictures are beautiful. I love the design on the jars Mary! I’m thinking they’d be great for canning jam… Maybe a batch with some honey in it:@) Your chalkboard looks great-Happy Summer! I would serve sweet tea in them. Love everything you do! Sitting on my porch filled with flowers! Those are so lovely. I’ll have to run over and see if they have them at our TJ Maxx. I would use them for cut flowers. Too pretty to use for canning. I used to be a beekeeper, so anything with bees on it is a temptation for me. I always use old or not so old jars for cut flowers in the summer…I even use straight out of the super market pickle jars…empty and de-labeled of course…the bee jars would hold special place of honor. I love your idea of using them at each place setting. I make raspberry jam each year and gift to neighbors. These would be perfect! Your ideas, flowers, and recipes, remind me of the blessings of summer. I would give rhe jars to my mom who at the age of 79 still enjoys making and canning muscadine, mayhaw, and other kinds of jelly. I would use these jars to serve sweet tea on my summer screened porch. What fun! And lavender lemonade — yum. I’d use the jars for flowers and lemonade! ;) I follow on FB and am a “friend”. Thanks for the chance! This has summertime written all over it and we are hitting the hot hot and hotter days. This would help! So refreshing pictures ! I would use such cute jars for my lavender honey !!! I would love to use them for jam- they would be beautiful for gifts. I’d make bee feeders out of them in order to feed my bee hives. Then I would use them to store honey from my hives! I would use those lovely jars to have a party and serve drinks to all my friends and family. We would celebrate the summer season in style. I love your posts and follow it faithfully. I’d BEE quite happy to use the jars for canning jam, sipping iced tea or lemonade, serving a special dessert or placing some flowers. I’m already a follower, Mary. Thanks for the opportunity to win! Someone will BEE very happy. I would use them in my kitchen to store sugar, salt, baking soda, etc. They would be so perfect. I hope I win. I love your garden shed. Those are sooo cool! I took the pledge to rid my cupboards of plastic. De-Plastifying my life! When I learned about the cancer-causing and hormone-disrupting chemicals in plastics, I knew I wanted to rid my life of plastics as much as possible. MayBEE I’d use them as a candle holder by putting tea candles in them for some outdoor ambiance or my favorite standby as a vase with some flowers! Thanks for the giveaway!! I would use them for summer arrangements and copy your idea of individual arrangements at each place setting. 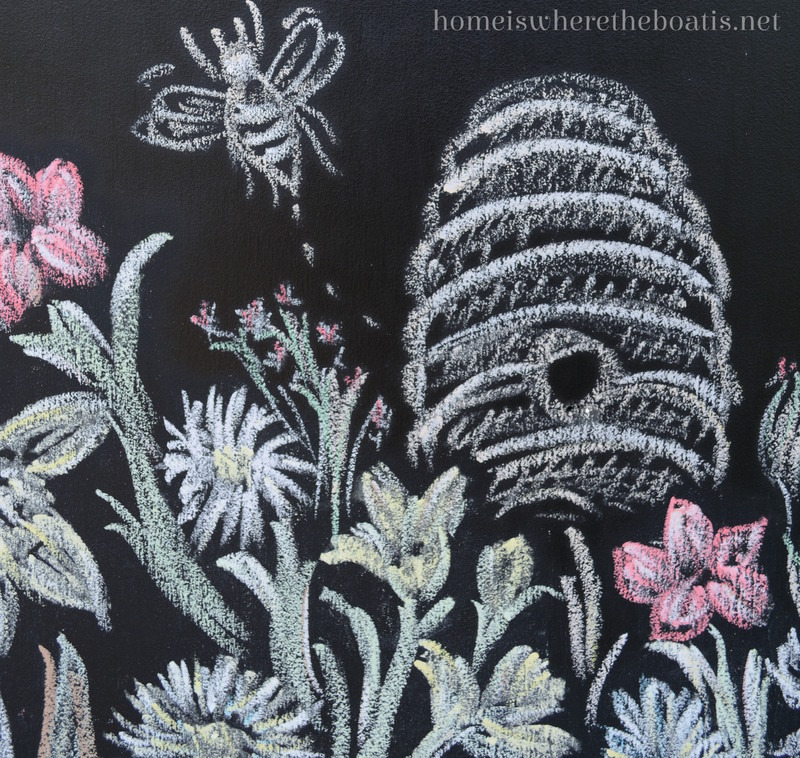 So many lovely features especially the bee skep, your chalkboard theme and drawing, the bee design on the jars, and the tablecloth and colors in your tablescape. 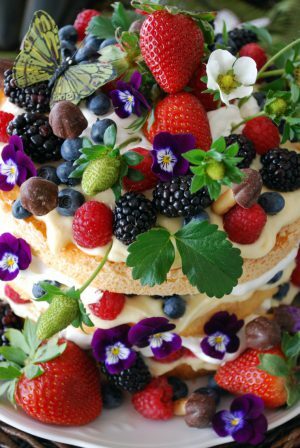 Enjoyed viewing the post again featuring the sweetest day dishes by Pfaltzgraff. This post IS the bees knees Mary! 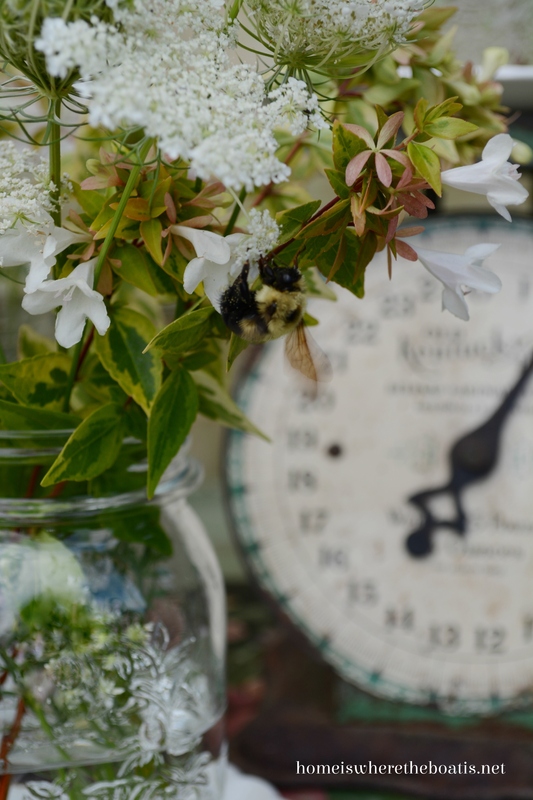 I have seen so many bee skeps lately, they are so full of personality~I can’t beelieve all your clever vignettes and touches everywhere in this post…well actually I can :) … the Quattro Stagioni jars are so pretty, I have become sort of a jar-a-holic, I am crazy for them! I use mine mostly for food storage, salad dressings etc., and they are great for craft supplies. I love them for flowers of course, and they are a perfect for gift containers. I wish I made preserves and wonderful things, but I have never tried that… you know I am a loyal fan and follower! Thanks for the bright and flower filled morning! The canning jars would go on top of our beehive (new and unused) that is in our great room. I would fill it with flowers and display it there with my vintage honey tins, smoker and decorative bee skep. I would make vanilla/lavender sugar in one, flowers in another and two with solar lights in them for outside! Love them!! I would use the for cupcakes. My daughter in law made to go cupcakes in mason jars – lots of yummy icing!! My initials are BB, so I consider the bee my mascot. I would put pretty wildflowers in the jars, set them on tables on my deck, and invite friends over for brunch on the deck. Of course, I would take lots of photos and post them on my blog. So many uses and I would use them for bouquets AND for drinks! I would love to have some! 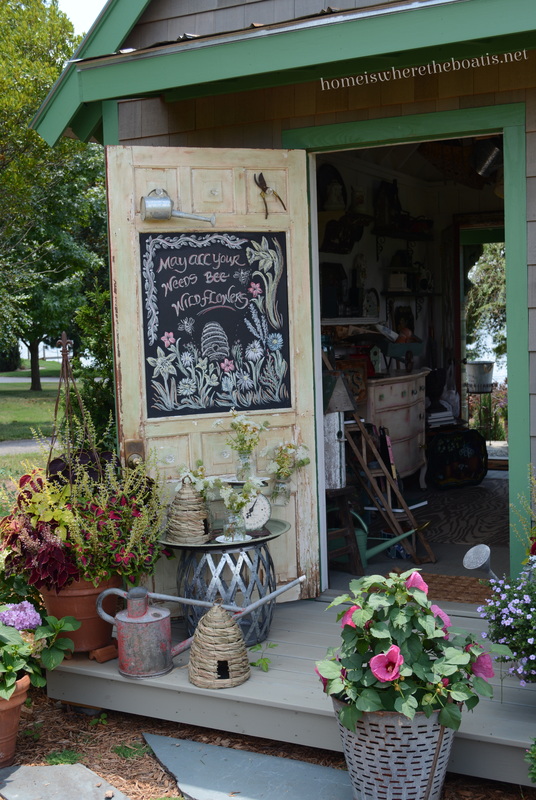 Canning jars with summer flowers – perfection! I am a follower, as you know! This is such a beautiful post. Where did you get the metal garden stool?? LOVE!!!! I subscribe and I follow! I’ve recently found you and am loving it! How would I use you ask? Definitely for flowers. I always have a small fresh bouquet on my coffee table. I do like the idea of using them to serve summer drinks also. You have such a delightful site! I have mad several of your recipes and they have all been a hit! Hard to choose, but I would use the bee jars for cutting flowers from my garden. I would use them for my homemade lemonade. Especially when I host our book club. These would be great for sipping lemonade. At least one would go in my “bee bathroom” and the rest would go next to my “bee Old Fashioned glasses” be used for beverages. So cute. I’ve always wanted canning jars but these are above and beyond with their adorably charming embossing. In summer, I’d put a string of microlights inside to simulate fireflies and put them on my farmhouse table. I’m an email subscriber. Wouldn’t miss it! 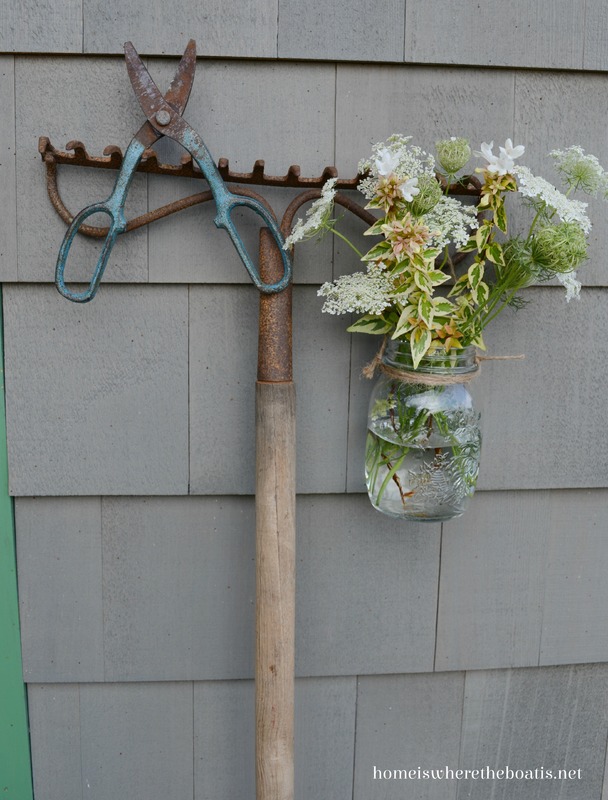 Reading your blog got me started on “canning jar love”. . .I would so love these with the bees! 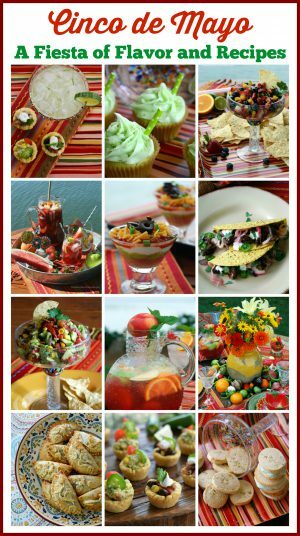 Thank you for sharing the cool recipes; I will definitely give them a try this weekend (my birthday!). I do follow you on FB, and I’ll share this post as well. Have a great day! 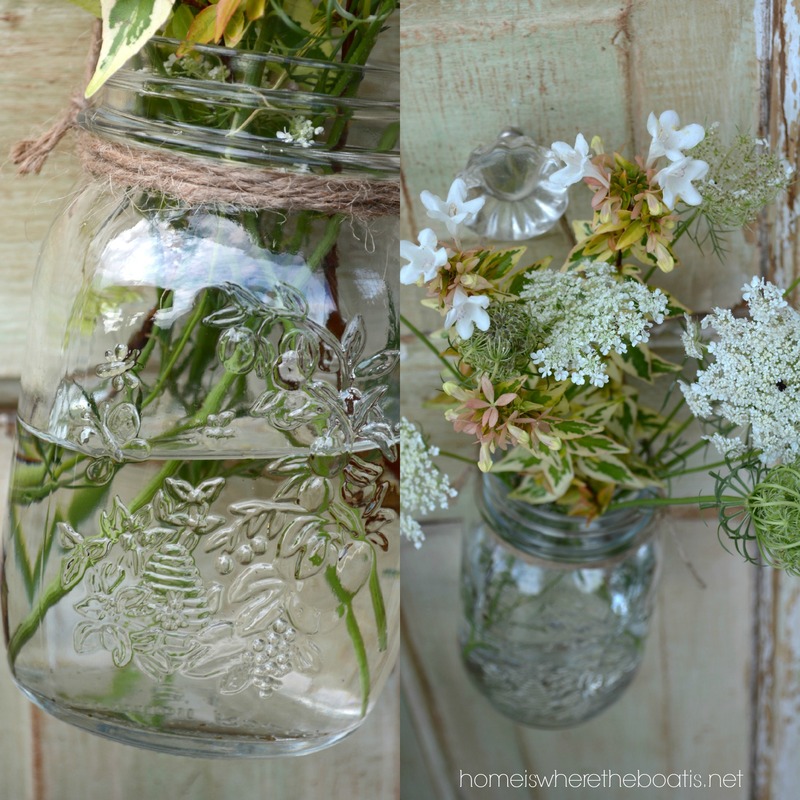 I would fill these adorable jars with flowers from the farm, put in some Queen Anne’s Lace (some plain and some dyed) and give them to my daughter and granddaughter! I am getting ready to make my Strawberry Margarita Jam and these would be perfect. I love that bee skep design. Good morning..what a wonderful post! I always leave happy when I visit your blog! I am a follower and receive your email for your blog postings. If I won your beautiful jars..I would use them as containers for flowers and or for drinking out of! What fun would that be! I did post this on my FB page! I would use them for some lavender lemonade and also for flowers in the sun room! Thanks for the opportunity. I would use them for all of your suggestions. I am taking a canning class at the local culinary center in August so I could use them after that class for canning. They are so pretty I’d definitely use them for display with flowers, candy, or as drinking glasses with lemonade or sangria! And I love to store my craft items like bits of ribbon, buttons, and other embellishments in jars so one would probably get allocated to the craft room where I could set it on my table to see all the time. I subscribe to your posts with e-mail alerts. Truly a beautiful post. Thanks for the effort that went into it and for the giveaway. I like the idea of mixing up a smoothie or sweet tea and sipping it right from the pretty jar. I can also see using them to serve utensils at a picnic! I love everything “Bees”so these would have so many uses in my home as drinkware, flower vases, food service or just looking beautiful. love the jars! I would use them for flowers at a wedding, or my dining room table for company. Everything you do is amazing. Those sweet jars would be in FL used as a base for a bee watering station in my FL friendly front garden until my Meyer lemons were ready to transform into porch sitting lemonade. Love the jars! I would use them just as you have. And to contain a few scrapbook and gardening (seeds from wild flowers in my yard) items! I. Need. These. Jars. I like you love flowers so I would indeed have beautiful flowers in mine placed around the home. I love the blackboard drawing! Beautiful. Lovely post. already a FOLLOWER on email & FB.. wouldn’t miss one of your fabulous poats.. I have been collecting everything BEEs for years.. yet my collection doesn’t have anything like these unique & fabulous treasures.. thee would be my EVERY DAY EVERYTHING!!! I love canning jars, old and new. I use them for storage, gifts of flowers and even for canning! I would use these to make rhubarb infused vodka. I would use the jars in my daughters wedding…she is having mason jars everywhere. I get you email and follow you on Facebook. One of my goals for the summer is to try making pickles for the first time. How perfect these jars would be! I subscribe to both email and fb. Thanks for all of the beauty you bring to us. I would share with friends – with the addition of flowers or something yummy! I love anything with bees on them and have quite a collection of bee skeps. I would use them for vases, drinks, all sorts of things! Beautiful. I would use as you did for wildflowers. And, for honey. Your images are so lovely and my favorite is the one of the bee on the flower! So many possibilities of using those beautiful jars! I would fill them with my homemade BBQ sauce! I love the idea of filling the jars with a little kosher salt and adding tea lights to highlight the design to place around the deck. I also love how they look with summer flowers on the table. And…I might even be inspired to try your recipe for picnic salad in a jar for a fall picnic with friends. I look forward to your emails and Pinterest posts for inspiration. Thanks! 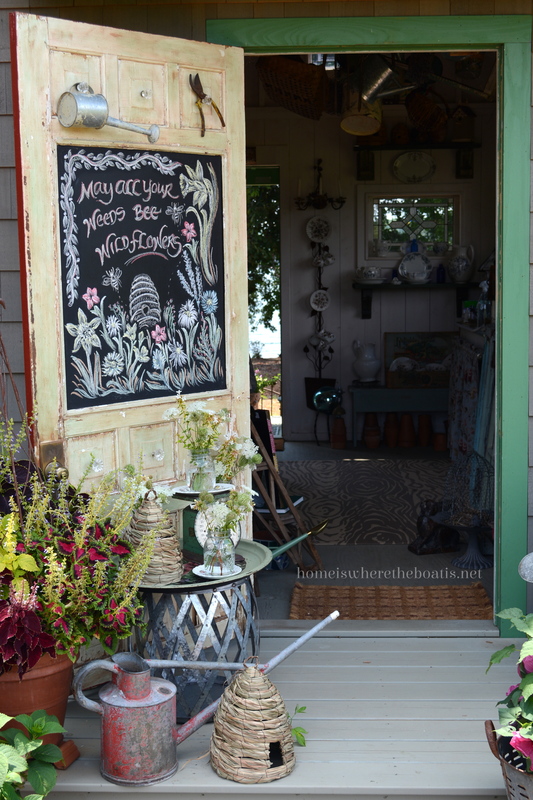 Such a pretty post w/ a real bee near the bee skeep. Love the jars. I was just in TJ Maxx and never noticed them. (Did you notice that Home Goods has extended it’s weekend hours?! ;o) I would use the jars just like you, for flowers. I love wildflowers in a jar. Like the garden stool, too! Bee-utiful post. Would definitely use for flowers! for holding votive candles for an early evening supper on the patio. What is the source for the wonderful metal/galvanized garden stool? I would use them for bouquets of zinnias and glasses of lemonade! I’ve never seen those jars but they are beautiful!!! DRINKS, DESSERTS, CANDLEHOLDERS! Drinks: Must try your Lavender Lemonade Cocktail, sweet tea, pink lemonade. Desserts: cupcakes in a jar, strawberry shortcake in a jar, layered chocolate pudding/strawberries/cool whip/repeat, brownies/ice cream. Candleholders: sand/sea salt/tiny rocks/sea glass/sea shells/ or colorful stones with a votive would make these unique jars SHINE! I love the design! I would definitely use them for summertime lemonade. Absolutely, love this! your blogs are so inspiring. i love the verity,—you inspire me! I fool your daily blog, have found you on pininteres and now I will add you to facebook. Keep up the great work! I would use these for , flowers, drinks, storage of threads and ribbons for crazy quilting hand work. Flower jar. Soap jar. Put cotton balls in. Put on favorite decorative shelf with decorative plates. I would love those jars to store my famous Orange Blossom Honey Marmalade! What perfect Christmas gifts that would make! The design on the jars is perfect! justshared your wonderful post on facebook and pininterest. Lovely jars! Do they have lids?? If so I would use them to store my dried herbs. I grow and dry my own. So they would look great in these jars. If not? One of my coffee bar designs is bee’s from Williams Sonoma. I have a few pieces, I used them to decorate the candy bar at a girlfriend’s BeeBee shower, and I would add these jars to my bee-rewing station. Thanks for sharing your great find. Bee-hold the giver of such adorable jars. I would use them to display all my wild flowers growing in abundance and try one filled with your lovely recipe for Lavender Lemonade cocktail, while gazing at the delightful gift. Thanks Mary for the opportunity and just love your blog site. I would use them to hold wildflower bouquets and that cocktail looks good too. I follow by email. Love these jars. 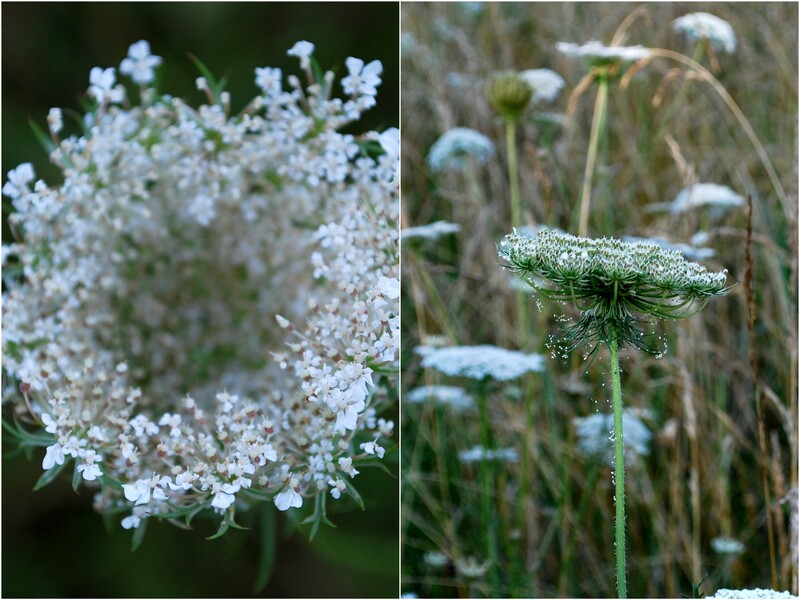 The Queen Anne’s Lace is beautiful in them. I am a subscriber and a follower on Facebook. Thanks for the giveaway. Just found your blog today, love it! I live on the lake also and so was so interested to see which lake you live on. I joined your e-mail subscription. I would love for you to check out my blog! I love the charming and adorable Quattro Stagioni canning jars. Any canning jar brings back fond memories of my childhood days when canning was an annual event for my parents, grandparents, aunts and uncles–the entire family. It was a way to reap the rewards of their gardening labors long after the garden was gone for the year. I can still recall waiting for the seals to click/pop indicating that the jar had perfectly sealed the contents safely. I would use the jars to hold flowers from my garden and also would love to serve beverages from them on my “soon to be completed” new porch. Thank you for your beautiful blog. It puts a smile on my face whenever I see the notice in my inbox! I love the jar! I would love to use it for fresh flowers! It would be perfect in my kitchen! I follow your blog, and look forward to the beautiful table arrangements! Such an inspiration! 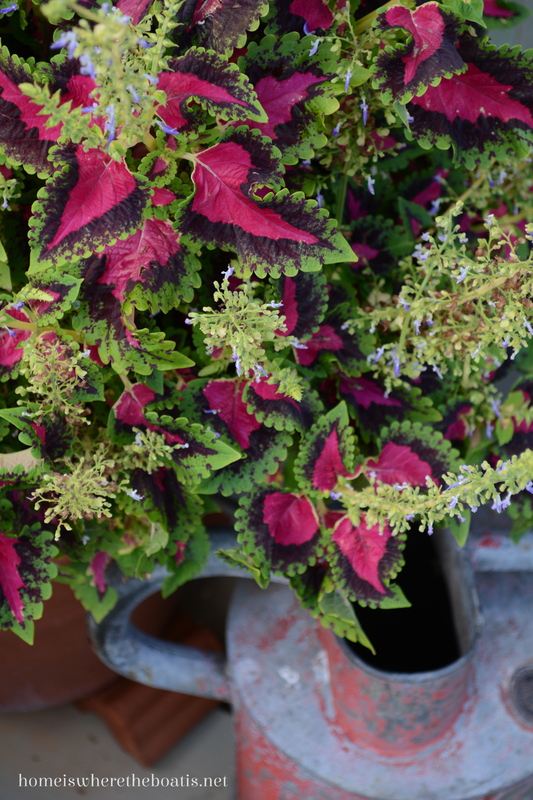 This would be great for flowers on the tables – Indoor or outdoor! Oh, Mary, I just love those jars! I am a sucker for anything with a bee skep on it. I have been in love with the idea you’ve taught me for packing salads in jars…so much easier in the cooler. These jars would definitely be used for that purpose. What a great jar for a summer picnic! P.S. Just looked at your link for the Passion flower. It has a beautiful bloom. It would be nice if you could train it to grow where you want it to. Do you think you could without it becoming too invasive for you? Well, I’d use at least one to hold some of my flowers from my yard and the others as drinking glasses. I’m just down the road from you in Charlotte. Love, love, LOVE these jars! Since I do handmade jewelry, I may use them for bead storage….but I have this vision of doing some detail painting of the design on at least one to use for flowers….or whatever hits my fancy at the time. I subscribe to your blog posts and love every one of them! Since I don’t live in the continental US, I can’t participate but would like to know if you have a source, other than the retail stores you mention (which we don’t have here) for the Quattro Stagioni Canning Jars. As for the passion flower vine (my Georgia born grandmother called it May Pops)…It does grow fast, but I would not consider it an invasive unless it fruits and the fruit drops, rots and seeds get spread. I have two varieties growing and one of them gives me fruit twice a year…not sure if the plant would fruit for you having a shorter ‘summer’ than we do. The blooms are spectacular! I would definitely use the jars for drinking glasses and for flowers. Enjoy your blog! I would use them either for glasses or vases for a bee themed tea party for my granddaughter! I’ve got a bee hive cookie cutter that I’ve been wanting to use! What a beautiful blog and lovely photos – my first time visiting! I can feel the lazy days by the lake. I’ve never used canning jars before, but I think they are lovely for the garden bouquets…or some pink lemonade on the porch. I’d use the jar for flowers from my garden! Bees love ‘um! I would just have to use them for canning…perhaps the strawberry rhubarb filling I put up so we can have summer-fresh pies in winter. These jars are so beautiful! Love the mason jars! I would love to use them for drinking cups or as vases! I love fresh flowers!! 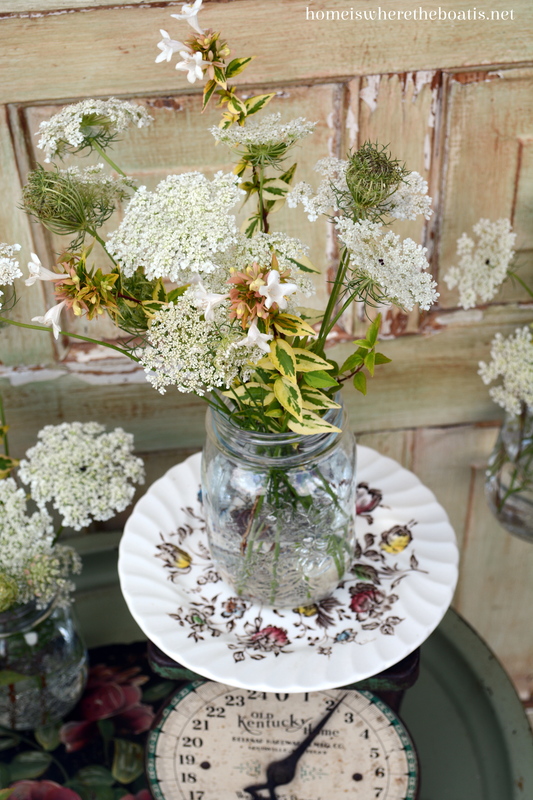 I love Queen Anne’s Lace. My daughter was just married and we insisted that the florist put some in her bridal bouquet – so lovely!! 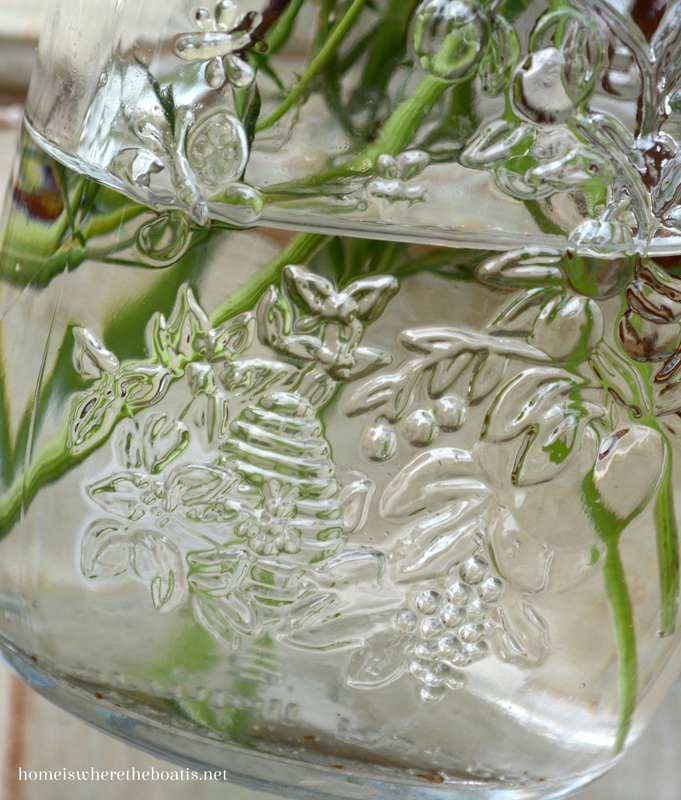 I would use these delightful jars to hold the roses and hydrangeas growing in my flower garden! Oh, this would be a wonderful gift for my bee loving niece! Of course, I love them, too! Very cute! So pretty! You are as busy as a bee creating all these beautiful posts, and as sweet as honey to give these gifts! You and ML, so generous! Recently we brought home a 1947 Spartan Manor. We have named her DesiLu and we have chosen not to take her on the road but rather make her into our potting shed/garden center. These jars would be a delightful vintage touch in Des for holding flowers & wild cuttings And for holding a cold beverage while sitting in our new garden center. I love those jars! They would be so pretty used in so many different ways. I follow your blog and on Pinterest also. Thank you for the opportunity to win and for your wonderful ideas! These are beautiful! I’d use them as a vase of course but they also would make great gifts. I am a “bee” person. Everywhere I go, I wear a bee pin. When I first thought about what I’d do with the jars, I thought I would use them as gifts filled with jelly, which I give my 4 daughters each year at Christmas, but I’m not sure I am unselfish enough to give them away! May go to TJ’s and see if I can find more! Delightful blog! I have been collecting everything” Bees ” and honey pots for years!! I never tire of them! 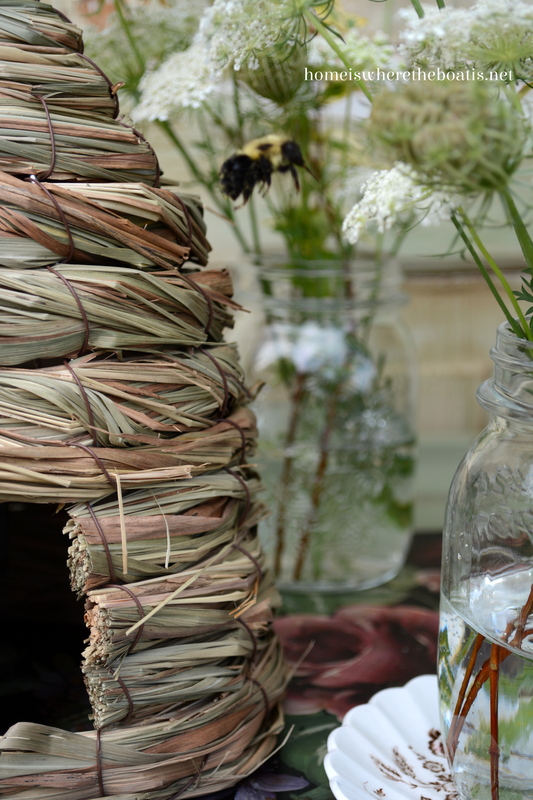 I love these jars, they are so unique and I would use them for flowers and storage…..
you know how to bee happy, thanks for sharing! I would use the jars for sipping. They r too cute. I would make a dessert from Mason Jar Crafts Love. Btw, the passionvine is the host/nectar plant for the Gulf Fritillary. If you can keep some, do so. Last year I was able to see all stages of the life cycle of that butterfly. Fun! I have used my old Mason jars for a project for the grandkids. Gave one to each at the start of our beach vacation . First a little sand then every day they add a shell, rock weed… whatever their favorite “find of the day is”. This works great when it’s time to pack up and go home…Just screw on the lids. Their mom really likes it- no more sand shells etc. Spilling in the car. Plus they have a beach remembrance for their bedrooms for a year. Then we do it all over the next summer!!! Thanks for letting me share, I am new at this. Sweetest Day setting. We would share the cute bee etched jars filled with flowers, to set up our table. She lives in the Mts. of NC & I live in FL but, we discuss on the phone about what your posting subject was every day and what we loved about it. My friend has a bee skep cake pan and we plan to make the cake part of our setting. We are both email followers and look forward to your posting everyday. Hope we win the amazing bee skep jars!! Thank you for all of your wonderful posts. I have tried so many of your recipes. I would use the jars for everything! My first thought is to use them for making pear preserves this fall for my family in memory of my Dad. I always get a chuckle remembering that he left my mom in charge of turning his yearly “batch” of pear preserves off one night when he went to a meeting when I was young. Unfortunately, my mom got engrossed in an Elvis movie on television and forgot. When Dad got home, they were burned and boy was he upset. My mom hardly noticed since the Elvis movie was still on. If I win, I can pick them up! I live in Raleigh and love to go to Charlotte. Can’t wait for the drawing! Love everything you do. Your style is fantastic! I would use these as vases for my beloved flowers and for plant clippings. Love the designs on them! I would put Spiced Peaches made like Aunt Ruby used to make them in the jars and give them to all her nieces and nephews for Christmas gifts. What a fun post! Since my name is Melissa, which means “honeybee” in Greek, I would use one as my toothbrush holder in the bathroom to match my bee towels! The rest would be candle holders for outdoor evenings. I am a subscriber so this is my second entry. Cheers! Oh Mary, this post was exceptionally beautiful. I loved the wildflowers and all the ways you have displayed them. You have a true artistic eye. I have been filling you blog for a long time now and every post is like unwrapping a gift of beauty! I adore these jars. I would use them to hold flowers, store foodstuffs and use as a glass. Please keep your beautiful posts coming. 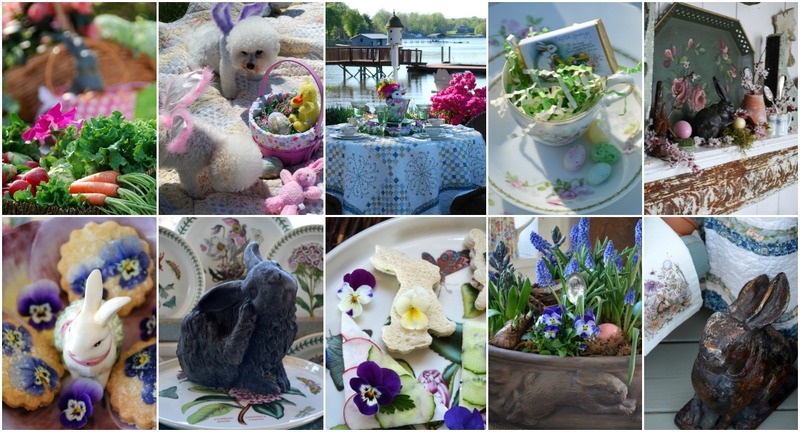 I just Love seeing your Potting Shed all decorated for the Seasons….and your table settings. I never heard of these jars before. If I won, I would use them for displaying flowers. Thank You for the chance to win! I am a subscriber to your e-mail Blog Posts. I am a follower on your Face Book Page. Hi Mary…love this post…I would give the Quattro Stagioni canning jars to my Dad who has beehives for his honey….it’s wonderful stuff! They were my grandfathers and I hope they will be mine someday! I am a subscriber and I ollow you on facebook also!!! Just shared your post on my fb page!!! I would definitely use them for flowers! and also my little collection of sea glass…maybe perle cotton in lots of colors too! I could just sit at your table for hours enjoying the view and sipping on lavender lemonade! I follow you on FB too!!! I would do something a little different. I would use them for my makeup, brushes and lotions and potions. As I am a Makeup and Hair artist! Posted to FB and added you on FB! Have followed you for years via email. Do you really draw those flowers on your chalkboard?!? One of the things of yours I covet are the dishes you use in the Potting Shed. My MIL gave us a serving platter maybe 46 years ago….makes me happy just to see them….Mary, your blog is just a visual pleasure….a lovely guilty pleasure. Thanx. I have just found your website and am so enjoying the photography. I fell in love with this bee-autiful jars when I saw them. I think I might actually have to use them for making drinks such as you showed in one of the pictures. What better way to enjoy them than to drink a cocktail? They are just adorable and being able to use them on a regular basis would be delightful. I love your work and am so glad I have found you! 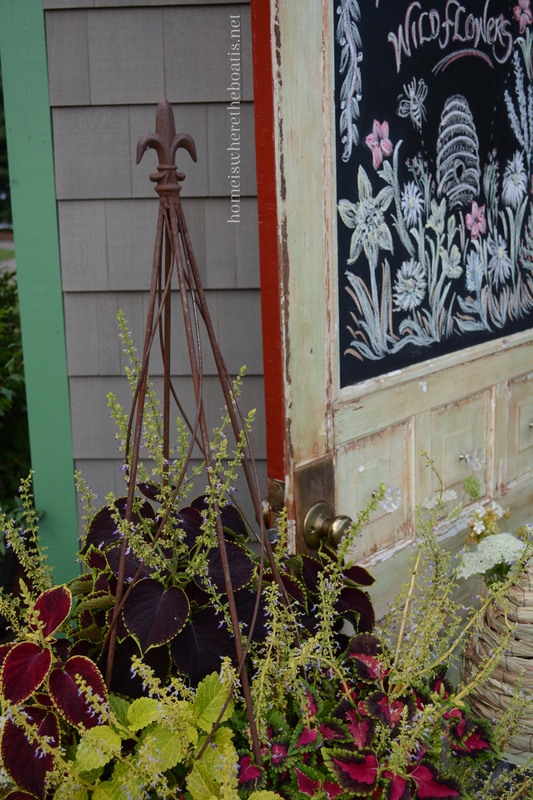 Visiting from French Country Cottage ( I’m in Montreal Canada – so not part of the give away I’m sure ) but really wanted to tell you how beautiful everything looks – I’m so in love with that metal garden stool, I can’t tell you – it’s just so perfect for – well – the garden LOL !!! 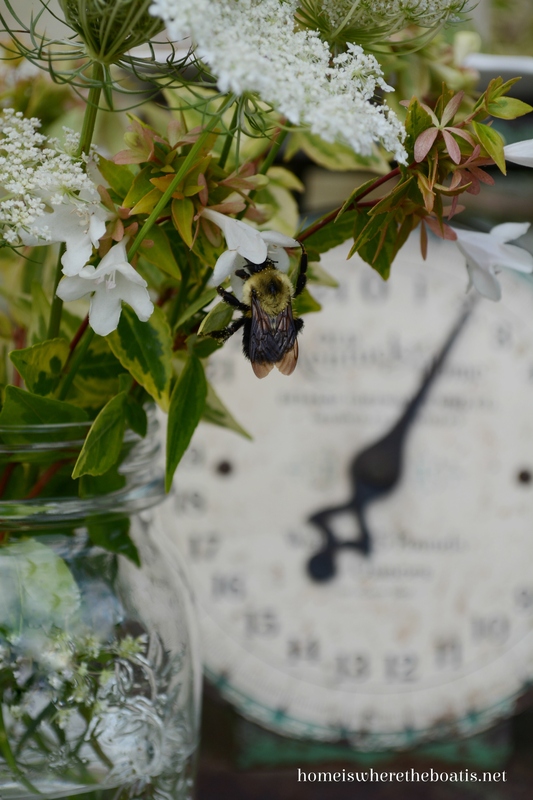 You and your fabulous tablescapes, recipes and the coveted garden shed are truly “the bees knees”..I would be a “copy kat” and use them just as you have!…. Have been a very happy follower for years!.. Love sharing you on Facebook!!! We’d use them for drinking glasses or jelly. Email follower. I would use these to serve up goodies and flowers for my garden club. Perfect for a bee-utiful table. Thank you for this give away. Your email notice in my inbox is always a welcome delight. I enjoy the eye candy of your creativity. Dishes are a passion of mine. I would love to use the jars for displaying flowers on a tablescape . They remind me of my grandmother who always saved every jar she could to use for homemade canning. She washed them carefully and put them on a shelf as if she was displaying something exquisite. Thank you for the opportunity to have a chance to win something my grandmother would have loved! 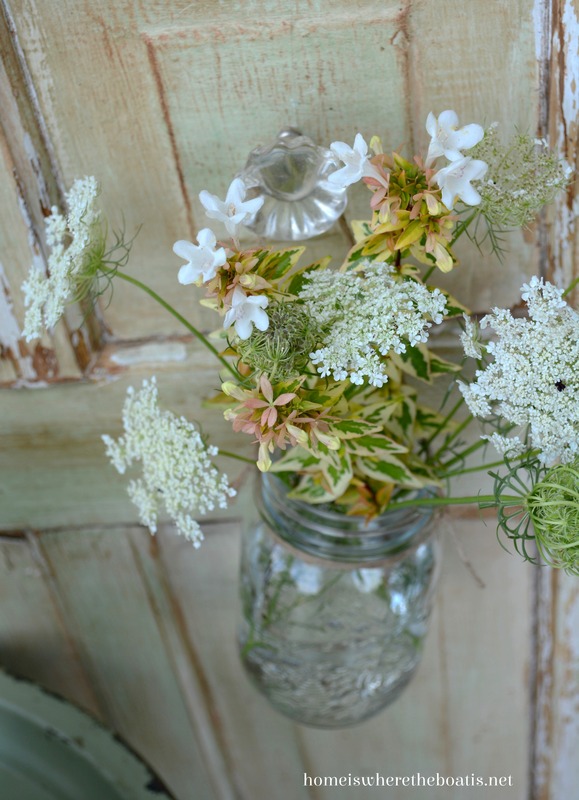 What a refreshing summer table…is that gooseneck loosestrife in your bouquet? I lost mine last year during that really hot spell…never thought anything would do it in seeing it spreads like wildfire. I would use the jars for layered salads and flowers. Have a wonderful weekend, Mary. Very cute. I may give one to my friend who has a “bee” bedroom motif, then fill the rest with homemade lemoncello! I love when you show up in my e-mail box with your lovely pictures. Thanks! Thank you for sharing this giveaway. They are adorable jars. I’ve been gathering blue ball canning jars for my homemade laundry soap and the moment that I saw these in this article makes them my new favorite “go to jar”. Who would of thought that these could be found at T.J. Maxx. beautiful pictures. Love the black board! I would use them the same way you have……so beautiful. Lovely jars! I would put fresh flowers in them for our kitchen table. Such cute jars! 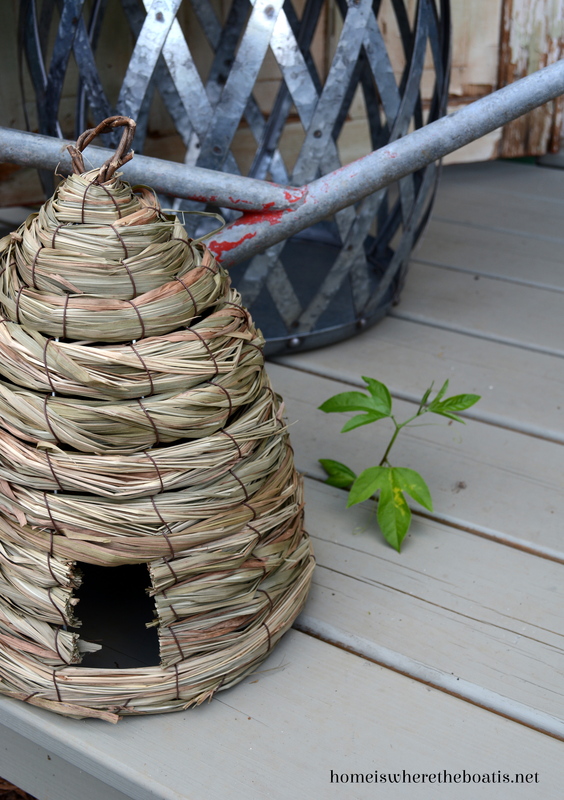 I love bee skeps and I never have seen them used decoratively like this. I make different kinds of butter with flavored honeys and give them as gifts; I think this would be the perfect container. I also love your idea to use them at place settings with small bouquets as well as drinking jars. Such a neat giveaway! I am also an email subscriber as of a couple of weeks. I have seen a lot of your ideas posted on Pinterest and I am now following your blog so I can get them directly. I really enjoy your posts. Mary – I am not just trying to flatter you so I can get some of these awesome jars, but i would try to duplicate your wildflower bouquet! This year, the Queen Anne’s Lace is growing particularly beautiful and I really love it! As we were driving to South Carolina we saw them all along the highways and I actually stopped and picked some up for our hotel room. Love your post! I need one of those skeps, too! I would love to win a set of these jars to add to my collection. I use them for flowers, storing anything that will fit in these size of jars. thanks for proving the giveaway. HOW timely…I would use them for gifting applesauce…it would look so tasty in such lovely jars. I gave away most of my canning jars to a dear granddaughter and each year give away applesauce to friends and family. THank you for the practical and sweet giveaway. LOVe your Charleston pictures. My brother lived there for a great many years and of course that was a great many years ago, n’est ce pas? This is so gorgeous! I love to can, and I love to set a beautiful table, so I’d probably use these beautiful jars for all – canning, storing, serving and cut flowers! Hi Mary! I just followed you on Facebook (don’t know how I missed that – I’ve been following you on Pinterest forever. Here’s my second entry. Would use them for displaying beautiful flowers, serving iced tea or lemonade, filling with lots of golden honey or just sitting some in the cabinet on my porch. I would use them for watermelon slushies with pretty floral straws for my bridge group. I love the bee motif….so cute. The wildflowers are so pretty that you have arranged in them too…Hmmmmm! So many ideas. Love them, would definitely use one for flower bouquets. But would love to use the second one in my sewing room for maybe buttons. They do make me smile. These canning jars are so beautiful! I would use one as a vase in a tablescape setting featuring my Alpine Strawberry (Roy Kirkham) plates. The others I would use for my first attempt at canning. I’ve been wanting to try canning, but these beautiful canning jars would make me so much more motivated! Thanks for always creating such a lovely blog! I would use them as drinking jars for sipping sweet tea next to our flower garden with friends. They are lovely! I would use them for Lake Norman honey courtesy of Shepherd Valley Micro Farm. This is absolutely beautiful!! I love lemonade and lavender, cant wait to try this! The beeskep look so pretty that way, I would definitely decorate with mine this way!! The jars could be used for anything, but I think I would fill them with my summer vacation collections, my heart stones from Cape Cod, my shells from Jersey Shore, some sand and shells from my Fabulous at 50 trip to Mexico! Then put them on display for all to see so, I can share my vacation memories!! Love the beauty over here, and so happy to have found you and all you inspire. Would love the jar for so many inspiring reasons! I could so see it in the mix of my euro kitchen. Thank you for hosting such a GiveAway! I’d tie a burlap ribbon around the neck of the jar and do some little arrangements with sunflowers or daisies, limelight hydrangeas and orange zinnias from my garden and place them at each place setting for the guests at an outdoor dinner party. Enjoying your blog! Thanks for the giveaway! Love these… I just participated in a bee themed birthday party for my niece Zoe by decorating the cake. I would love to find some of these jars. Gorgeous photos! Love the tablescape and the water view! I would use them as candle holders. I would use them to put flowers in and display around my house. Thank you for the giveaway. Would love to serve your Watermelon Mojito in them! Just beautiful. How bee- u- tiful! What a cute jar for storing our bee- loved bees honey! I would love to serve your watermelon mojitos in these jars with perhaps a jar full of daisys on the table? I shared the link on facebook so all my friends can enjoy your blog as much as I do! Love these jars. Would defiinitely use them for the watermelon mojitos that I can’t wait to try! 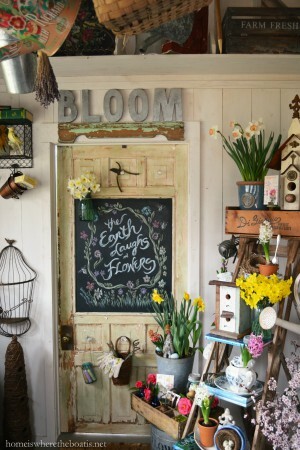 I also love them as individual vases with wildflowers….would do that too. Love your blog and all the beautiful inspiration it gives me! I loved the watermelon mojitos in these jars. I love the paper straw too- I have bought them in all colors and love to use them in table settings to add color, they are so fun! You make everything look so beautiful. Thanks for posting all your table settings and recipes. I really appreciate it and steal your ideas all the time! I would use them to store some honey from the farmers market! Your canning jars are beautiful. I would can some homemade chutney made with honey. It’s all so beautiful! I would use the jars to serve drinks, or showcase flowers, or house individual servings of a picnic salad or dessert. Thanks for the inspiration. ~MarY~ you are the “Queen Bee” that is for sure !! The jars are lovely. I love the pretty bees’ jars. I would use them for flower vases, votive holders with sand in the bottom and for iced tea. You never fail to inspire! I would use them to enjoy my raspberry iced tea while sitting on my back deck enjoying my beautiful garden. I would use them for flowers and for putting my home made lime pickles in. They are just too cute. Love your blog. I buy local honey from a friend of a friend. So wouldn’t it be awesome to have him put my honey and comb in these beautiful jars. Also, I have a lemon tree in the back yard and the honey bees love it. I’m thinking it would be cute to cut a few flowering branches and make an arrangement in jar. And of course great for serving fresh lemon tea sweetened with honey. Thanks for letting me share. I love everything you post and your puppies. My birthday is August 8th and what a lovely gift they would make. I use my canning jars for flowers also. 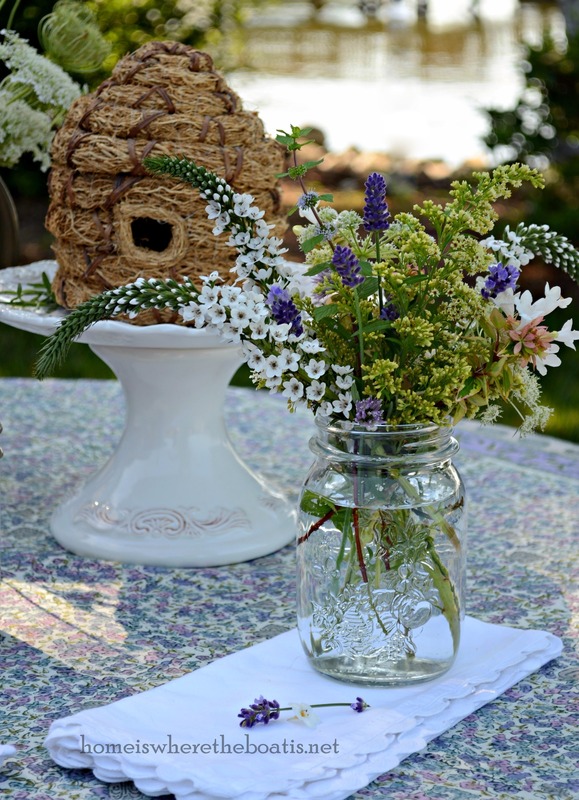 I would also enjoy these lovely jars for canning and creating a bee inspired tablescape! Thanks for the joy your post bring to so many. I subscribe to your email and facebook page. Watermelon is one of my favorite summer time treats, can’t wait to try the Shrimp Salad and several of the recipes you shared. Great giveaway!! Thanks! What an AMAZING post! The photos are, as always, DIVINE! I would sooooooooooo love to win your jar giveaway. I had never seen those darling jars & I LOVE BEE’S. Please enter my name & boy am I lucky to see this just under the wire. Tomorrow is the big day! Keeping my fingers crossed that the girls (Chloe & Gracie of course) draw my name! Thanks for being so generous with this giveaway! 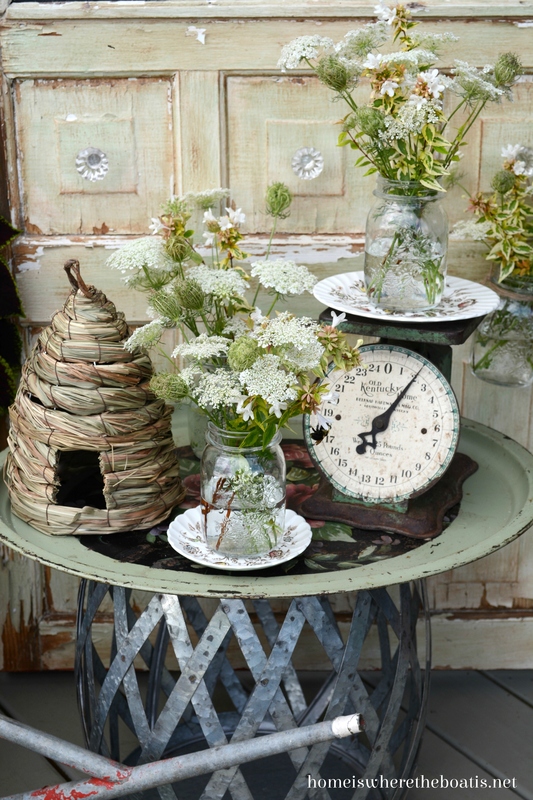 I just found your site…how lucky am I. I collect anything with bees skeps or bumble bees….Just love your table setting. A new follower on Pinterest too…Love your style!! !